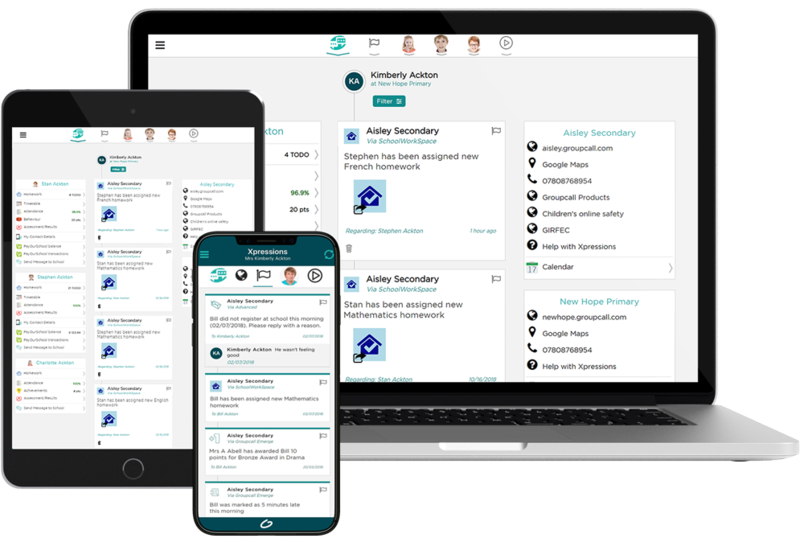 Enhanced Xpressions adds additional data from your school’s MIS to the messaging functionality of Xpressions, and provides parents with a better view of their child’s school life. This includes the facility to provide the following data from your MIS to parents: Attendance, Timetables, Behaviour, Achievements, School Calendar, and Assessments. Enhanced Xpressions is currently only available for SIMs schools. If you are not already subscribed to Enhanced Xpressions, but would like to know how this can work for your school, click here to get in touch. The below chart displays the MIS’ that Xpressions (Core and Enhanced) currently support. If you are already using the Core only Service as a part of your Messenger subscription, a very small setup/install process will be needed to enable the Enhanced features. This will include components of Emerge if you don’t already use this. The setup will be completed by Groupcall Support upon request. Contact your account manager for further information on this process. You will be able to view/amend your settings for Xpressions Enhanced from manage.groupcall.com. If you are unsure of your login details for the Manage Portal, click here to get in touch with the Support team. To amend the data that is displayed for parents in Xpressions Enhanced, follow the steps below. 1) Open your Emerge Management Console (usually installed on the server) and click on the Settings tab from the top of the page. 2) From the panel on the lower left, choose Xpressions Enhanced from the Section dropdown menu. Only Behaviour since: limit the amount of behaviour records parents can view. Behaviour Comments: display or hide additional comments that teachers have added to behaviour records in SIMS. Only Achievements since: limit the amount of achievement records parents can view. Lesson Attendance: display or hide lesson attendance marks (not registration class) from the app. Disable associated staff: prevent parents from viewing staff members that are linked to their students from the app. Associated User-Defined groups: display or hide these group types in Xpressions. Associated Discovery groups: display or hide these group types in Xpressions. Staff Photos: display or hide staff photos from SIMS to display in the Xpressions App for parents (via Associated Staff). Attendance ‘No Mark’: will include no marks in the attendance summary that parents see. If your school has subscribed to Enhanced Xpressions, parents will be able to access the additional information via Student Details. 1) Parents need to open the app and log in if they haven’t already done so. 2) They then need to tap on the hamburger icon and then tap on the student that they wish to view. 1) Parents need to visit xpressions.groupcall.com and log into their account. a. Click on the student's icon from the side menu, then click Student Details. b. Click the globe icon from the side menu, then click Student Details under the name of the student. Once parents have accessed the student details area from either your app or the website, the information you will be able to see is the same. Parents will need to click on any of the option provided on the menu on the left of the page. Your school administrator will have access to limit what additional information parents can see from Student Details. Depending on the settings chosen in the Emerge Management Console, parents can view the following information from their Xpressions. From the Summary page, you will be able to view the student’s Registration Group, as well as their current lesson (if they have one timetabled). The Attendance Summary will provide a chart, along with a colour key, summarising the student’s attendance for the year so far. This information is available on both the website and the app, it will just be presented slightly differently. Parents will be able to view the student’s lesson timetable for the week. A more detailed breakdown of the student’s attendance for the academic year so far. 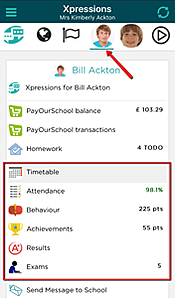 Similar to how staff can track attendance in Emerge, parents will be able to see the student’s entire attendance record. Parents will also have a breakdown of attendance to track any patterns of absence or lateness. Lesson attendance can be restricted via Settings. 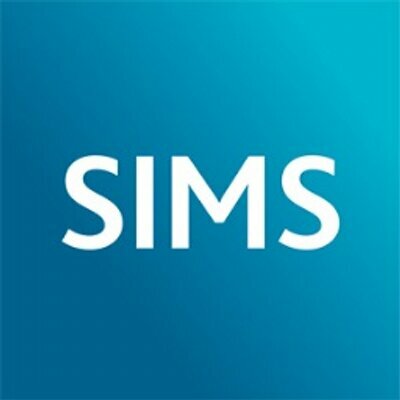 As well as a summary of behaviour points, parents will also see a full list of any behaviour incidents that have been recorded in SIMS. Any behaviour records can be expanded to view further details recorded by the school. Behaviour records be limited via Settings. Displayed in the same format as behaviour points, parents will see a summary of achievement points as well as all achievement records for the academic year so far. Any achievement records can be selected to view details in full. Achievement records can be limited via the Settings. Parents can view upcoming exam information from both the app and the website. Parents will see an Assessments tab when viewing Student Details from the app. This tab will display upcoming assessments that are stored for students in your MIS. For information and instructions on how to set this up correctly, click here. It is important to note that any assessments you choose to share will be shown in full. This feature is coming to the website very soon. Parents using the app will be able to view the names of teachers that the student is linked to. Staff will appear in this list if they are linked to the student in SIMS, e.g. the student’s class teachers, head of year/house etc. This feature can be disabled from your Settings.